Objectives: The new method of using mathematics communication activities for improving the teaching and learning of mathematics for pupils of age 9-18 will be presented and elaborated. Trainees will also have hands on experience by playing roles of pupils and roles of teachers within the training programme. Trainees will be trained how to use the materials of the course, which are the outcomes of the project Le-MATH. Day 1 - Arrivals and meeting each other. Promote European Dimension. Day 2 - Introduction to the Le-MATH Project, aims and objectives, history. Introduction to Science and Math Communication, current trends. Presentation of the Manual of Good Practices, review and discussion. Definitions for the two methods, MATHFactor and MATHeatre. Discussion of the expected practical work and course assignment. Market Place set up for the participants and presentations of their background. Expected Learning Outcomes: Develop a bigger understanding for current trends in teaching mathematics. Specify the aims and objectives of the Le-MATH projectm and the history behind the project. Identify the two methods, MATHFactor and MATHeatre. Increased knowledge of the participants' culture and countries. Day 3 - Definitions for the two methods, MATHFactor and MATHeatre, continue. 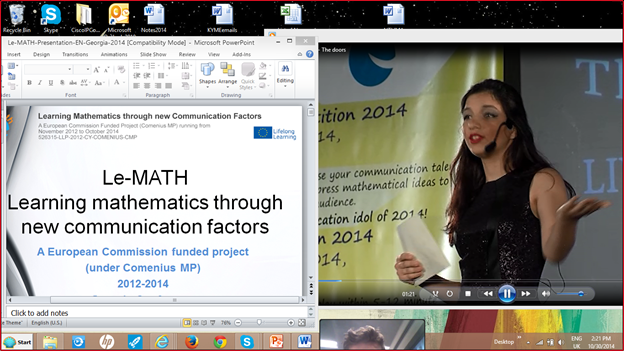 Presentation of the MATHFactor Guidelines and related documents. Presentation of related video. Practical work and evaluation practice. (Social Event). Expected Learning Outcomes: Identify and comprehend the two methods, MATHFactor and MATHeatre. Discuss and define why and how to use them in the classroom. 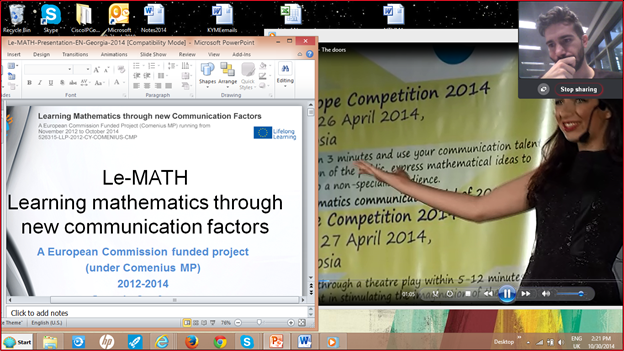 Understanting of the method "MATHFactor" through the guidelines and videos. Identify the tools for evaluation through practical application and understanding of evaluation. Day 4 - Presentation of the MATHeatre Guidelines and related documents. Presentation of related video. Practical work and evaluation practice. (Social Event). Expected Learning Outcomes: Understanding of the method "MATHeatre" through the guidelines and videos. Understand and apply the tools for evaluation of plays. Identify the tools for evaluation through practical application and understanding of evaluation. Day 5 - Preparation by participants for their assignment, either a MATHFactor presentation or a MATHeatre play with other participants. Rehearsals and practice. Expected Learning Outcomes: Compose scripts for the method(s). Apply the method(s) to communicate mathematics through oral presentation or play. Increase ability to work in multidisciplinary teams. Materials of the course: Manual of scripts for MATHeatre Manual of scripts for MATHFactor, Manual of Good Practices – Electronic Form, MATHFactor Guidebook, Manual of Scripts for MATHFactor, MATHeatre Guidebook, Manual of Scripts for MATHeatre, Mathematical Stories for Theatre, Conference Paper publications and articles, Video examples of MATHFactor and MATHeatre, Evaluation forms and assessment sheets. Pre-course preparation: Participants will be asked to read the Guidebooks before coming to the course.